At the entrance of the co-op, there is always the “what’s on special” display. I’m often wooed by the fresh fruit and occasionally have gone a bit overboard with the produce. This week, the display had these lovely Hatch chiles. I’ve only had these chiles a couple times but the flavor and the mild heat win me over after one bite. 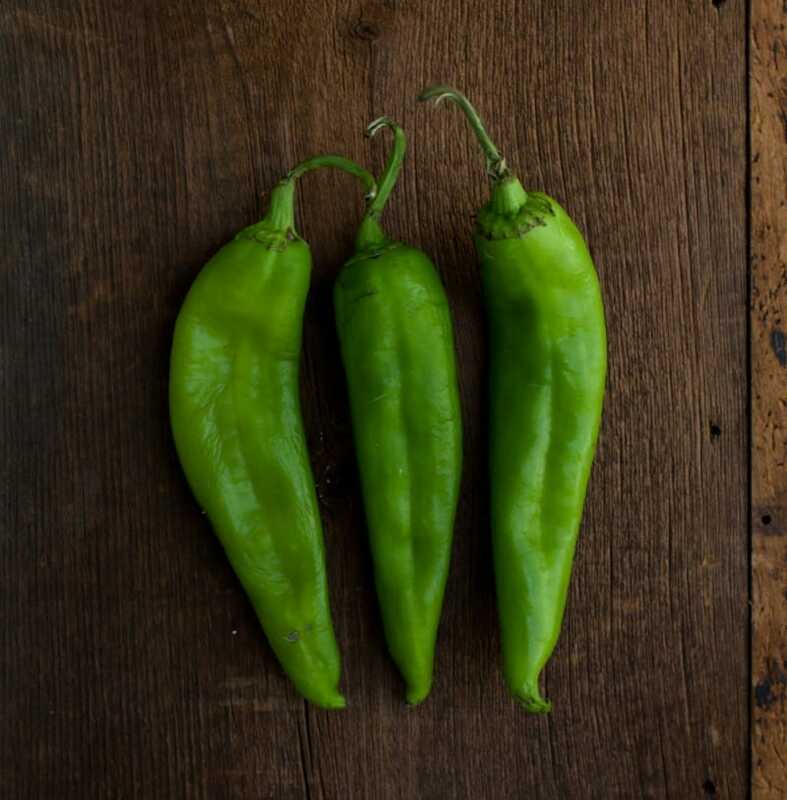 These chiles are a special treat straight from New Mexico. 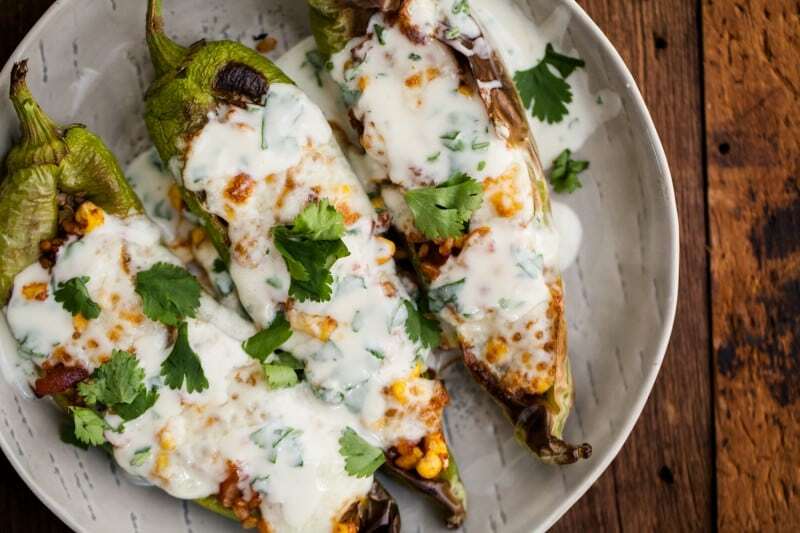 If you aren’t eating dairy, I highly recommend trying these without the cheese and replacing the yogurt sauce with a cashew cream cilantro sauce. Preheat broiler and place chiles in a roasted pan. Place under broiler for 1-2 minutes until chiles are blistering. Remove from oven and let cool. In a medium skillet, heat olive oil over medium-low heat. Mince onion and add to pan, cooking until translucent, 5-6 minutes. Remove corn kernels from cob, add to pan, and continue to cook for 3-4 more minutes. 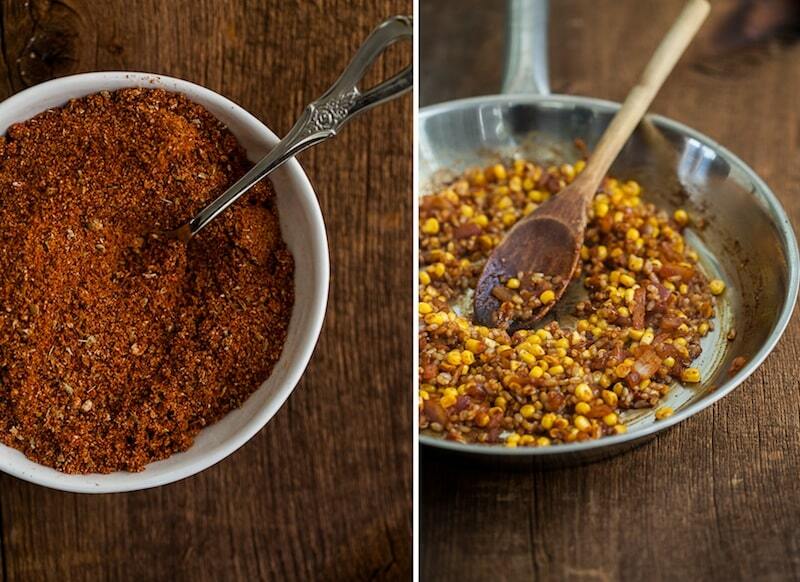 Combine spices, pepper, salt, and brown sugar in a bowl. Add to the pan along with the 1/4 cup of water. Stir until spices are mixed in. Add cooked rice and continue to heat for 1-2 minutes until rice is hot. Divide mixture into the four chiles and top with cheese. Return pan to under the broiler and heat until cheese is melted and lightly browning, 1-2 minutes. * Remove from oven. To serve, whisk together yogurt, lime juice, cilantro, and honey. Spoon over peppers and sprinkle with extra cilantro if desired. *I keep the rack in the middle of my oven, which can effect the time. Never leave anything under the broiler unattended as it’s really easy to burn food. Check after 20-30 seconds and go from there. I have a bag of these in the fridge and I’ve been going back and forth about what to do with them. 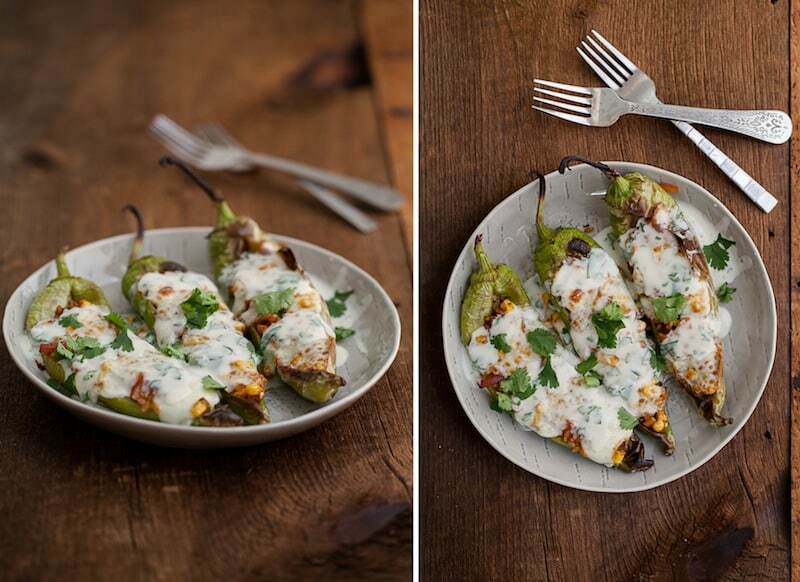 The charred chilies with the cool cilantro lime looks perfect. I’m definitely going to try these (sans the yogurt – it’s a fear of mine). They look super delicious, can’t wait to use some of our garden peppers for this! I cannot wait to give these a try! They look incredible! Love the yogurt sauce! I would have totally overbought these as well! Love the spices in the filling. These would be a very happy dinner for me. Mmmmmm those look delicious! Especially with all the yummy cheese over top! Is a hatch pepper super hot?? Never heard of them before! I believe they come in a range of heat- the ones I purchased were rather mild and had great flavor! I’ll be attending the Hatch chile festival at the end of the month,the smell of them roasting fills the air with the most make you hungry aroma you ever smelled! They range from mild to extra hot.Put some on a quality tortilla with skirt steak and Mexican cheese and it will be one of the best things you ever eat. Oh wow, these are so pretty! And they look super fulfilling. I love stuffed things in general, so I’m sure I will love these too! I just came across these at Whole Foods and was wondering how to prepare them. Must try this!! 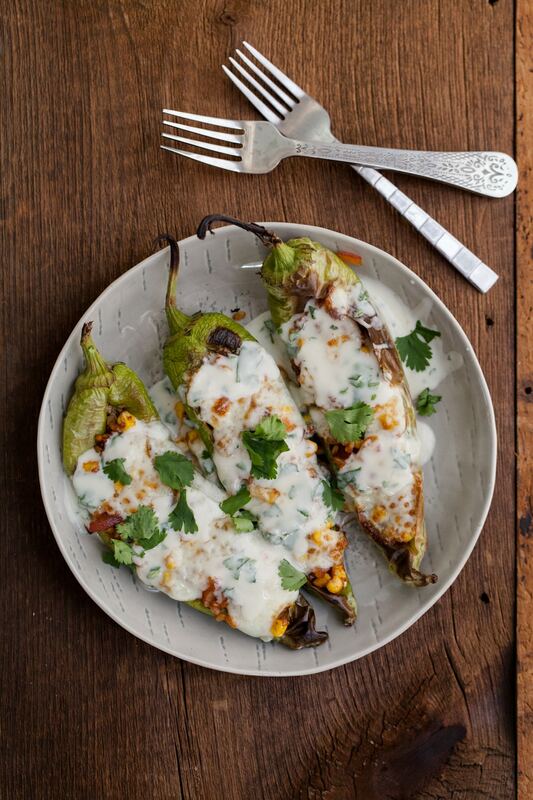 Those look delicious– I’ve never eaten the cooked skin on green chiles. When it’s charred, is it good to eat? I love the flavor the charred parts of the peppers add (I’ve always been the person who also like their toast nearly burnt). However, if you aren’t sure, I would guess you can always remove the skin after charing! This looks wonderful!! Question…did you find that you have to remove the outter skin after roasting?? Maybe roast to remove the skin, then stuff and roast to melt cheese? Or did you not notice that? These look delicious! I’ve never had a customer roast the chile post-stuffing. I’ll have to try it out at home sometime. On a side note, where did you get your chile? Made these last night. Whole family loved it. I doubled the rice to have leftovers and kids were fighting over it for boxes today. The yogurt sauce wad amazing, too. This is a keeper. Made it again with red peppers. So delicious. Thank you! Thank you for mentioning Hatch Green Chile. 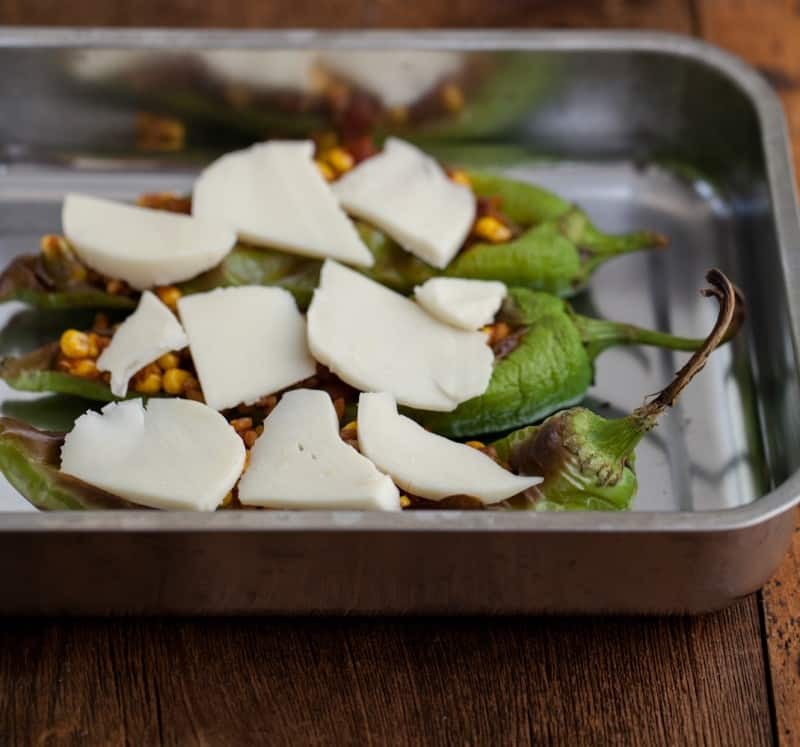 We would love to send you a free box of our Hatch Green Chile as a thank you! If you’re interested, please send me an email. My friend made stuffed Hatch Green Chile peppers today as an experiment. She stuffed them with a cream cheese blend and wrapped bacon around the whole pepper! She baked them until the bacon was cooked and the cream cheese was bubbling. We didn’t realize that we were suppose to roast them first. The skin didn’t bother me as much as it did her. We loved the taste of the peppers. They turned out to be quite tasty! 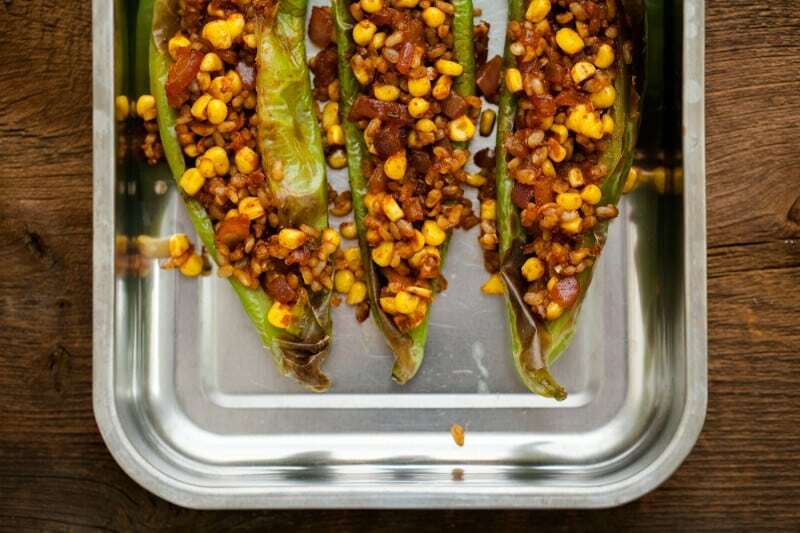 We will do this recipe again next when the Hatch Green peppers make it back to Iowa! Thank you so much for providing a beautiful website! Looks delicious! I just purchased hatch chiles for the first time and I’ve been researching how to cook them. Most recipes suggest peeling the chile after blistering. Do you leave them intact? I do but you could also peel them. I just don’t peel things unless I have to!